I don’t have a console but an android phone. how can I play fifa on the companion app. You can’t play FIFA on the Companion App without having the game for a console. However, you can play FIFA 16 Ultimate Team for Android that should be released very soon. I can’t sell players when I try to quick list them. I get an error. Plus I can’t quick sell either it says I don’t own the player. Please help. You will need to contact the EA Support. It will only works when you insert the FIFA 16 in your PS4. Have you tried in another browser ? So when I go on the transfer market for my Xbox One persona it shows I have to play Fifa 16 on the One but when I select my persona to 360 it shows the market is there. Also my players on the One are different from the 360? I’m planning on playing it on the One so what will happen to the players on the 360 persona? Yes. This year, 360 and One are different markets. You will not be able to use your 360 players when you start playing FIFA 16 on One. You Web App is linked to your 360. It means that you will not be able to carry over your FUT Web App early access progress to your XBox One. Last year it was exactly like this. EA recognized that it was a bug. It seems that the problem is back again. every time i log in it tells me i have been sent a code on my phone. But the code is for my old number and i cant get the code to put in to log in to ea. I also cant go to account management and change my number to my new one as when i try logging it says enter the code we sent to ur phone which is my old number. So i cant log in or change my old number to my new one. This means i cant use fifa 16 web app:( please help. Web app is stuck on loading screen forever. How do i solve this? Tried everything from clearing cache, cookies to trying a new browser and updating flash player. Also disabled ad blocker. None of it works. Can you help? In that case you will need to contact EA Support. Hey Rodrigo, i cant open the transfer market, i played fut15 on playstation 4 and i still cant open the transfer market, when i want to change my account i clicked on ok (so they load my new account in the game) and its not changed, help! Have you played FUT 15 on PS4 before August 1st ? Sorry, there was an error logging into the FUT Web Application. We were not able to verify your FUT 16 data. Please wait a while and try again by refreshing your browser. For help, please go to EA Answers HQ. EA is trying to find a fix for that. You can ask them for help. how do i unlock fifa 16 web app? Insert the FIFA 16 disc in your console. I didn’t buy Fifa 15 but I do have an origin account from fut14. Does that mean I can’t login? Yes, it is. Keep in mind that EA wants to sell games. Everything you said is true but you are missing something: you haven’t played FUT 15 on PS4 before August 1st. That’s why you can not get in. I played fut 15 on my ps3 but just bought a ps4, so I am unable to access the transfer market on the web app. I went and played fut 15 on my new ps4 to try and unlock the transfer market but it didnt work. Am I right in thinking that it should have worked? I played a few games on fut 15 on the ps4 so I should now have access to the transfer market on the web app. Is there anything I can do? The problem is that you played FUT 15 on your PS4 after August 1st. You will have to wait until Sept 22 or Sept 24. After going through the 3 steps it said that i don’t have a fut team yet. But that’s not true.. I’m playing fut for 3 years now.. How can i fix this ?? Im playing fut sinds fifa 2012. I tried to use the web app 2016 today but after going through the 3 steps it said that i never had an fut team and that i have to play 2012 again and make one. But i have one already …. Unfortunately, that’s a known bug. EA already know the “Login to FIFA 12” error but they still haven’t a way to fix it. I have played FUT since 2010, in FUT 15 i started playing on PS3, then i bought a PS4 in May i think, and i played FUT 15 then on PS4. I can log on just fine to FUT15 on my PS4 and play. But still it says unlock transfer market by playing the PS4 on the wen app. Are you sure you played FUT 15 on the PS4 before August 1st ? That is probably the reason. Exactly. Until you play FIFA 16 in your console. Its show up that i haven’t created club before. In that case, please contact the EA Support. I went to load up the web app and I entered my details as I should. But when I came to my security question I was blanked, I couldn’t think of it. So I clicked “lock account and sign into a trusted console”. So I loaded up my Xbox 1 and ultimate team came on straight away without asking for a new security question. So I can’t access the web app. What do I do? Try to contact the EA Support, please. Hey Rodrigo, I hvae the same problem. want to switch from pc to ps4 but nothing happens my origin acc is connected to psn… can you help me ? I have no idea..
i cant change the account on the web app from the xbox to the playstation. when i try it and change the persona nothing happens and im still on the xbox account:( how can i fix the problem?? please help ! Hi. Go to your Origin settings and add a new console there. Then, try again in the FUT 16 Web App to see if it shows. i have the same problem, everytime i tried logging into my ps4 account it would keep saying error and that i should try again so i gave my xbox 360 account a shot and it worked straight away. unfortunately, i dont intent on playing fifa 16 on my xbox so when i tried to change my account from the top right corner i would select the ps4 account, the app would reload and stay on the xbox account. Theres no point of me enjoying the web app because im not getting fifaon xbox. i have added everything into origin(which has both xbox and psn accounts) and i still cant change. Any help? What you describe happens to someone who selects the wrong console when prompted by the FUT Web App. If it wasn’t your case, please contact the EA Support. please don’t tell me I have to wait until it comes out on console because I need to get ahead with the daily gifts and my team.HELP? mine wont even load its just the back drop of a staduim nothing else help? Hi Rodrigo, I created a new fifa 15 account a few days ago and bought some fifa points! My question is seeing that I cant access the web app being a new player will I be able to access it on the 17th and will I be able to transfer my points to fut 16 being a “new player”? To transfer your FIFA Points you will need to access FIFA 16 through a console. If you have EA Access you can do it now. Otherwise, you will need to wait until 22/24 September. I know it can only be on the console, what I want to know is can I still transfer if I created my account now? It is not possible to carry over FIFA Points to other accounts. Your FP will be transferred in the account where you bought them, from FUT 15 to FUT 16 when you play it in the console. However, if you create a new FUT 15 account now and buy FIFA Points from there, you will be able to transfer FP to FIFA 16 from that account only. Usually you just need to go to your console to fix it. Please, go to your Origin settings and see if you can fix it from there. 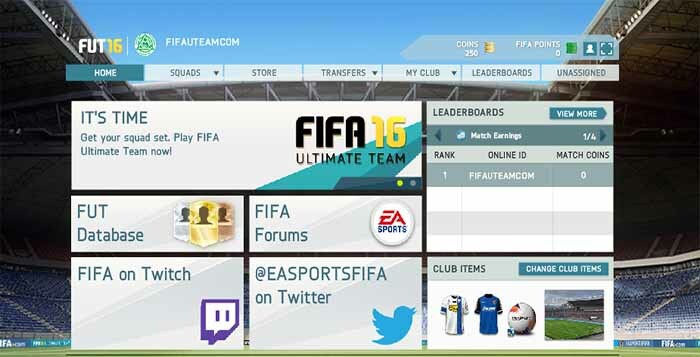 Try to go to the FUT 16 Web App and in the top right corner click under the persona icon (second from the right). Go to your Origin settings and set a new security question. Are you sure you are setting security questions to the right account ? In that case, you have to contact the EA Support please. I recently bought an Xbox One so changed my console on the web app to xbox one but now its saying I cant use the transfer market and I need to validate my Fifa 16 account on the console. Can I do this early or do I need to wait until the game comes out? You will have to wait until you play in the console. I’ve been reading all the guides and build up to Fifa 16 UT. I managed to sign up and get in with a new account, all is looking good. You may not remember, but I posted on Fifa 15 a few times, I use this site and still find it excellent for guidance and help/tips. (I mentioned a ZX Spectrum and Alan Shearer amongst a few other bits – after playing over 1000 games of Fifa 15 UT I managed to get my man and played about 20 games with Shearer, was fun while it lasted). I did make a comment on another article but it didn’t get posted/published, I am not sure why. I will happily e-mail you the content if you are about. This part of Fifa UT is very exciting, the first time I have ever managed to get ‘early access’ through the web app. I am still not sure what team to do this year, on Fifa 14 I did German/Bundesliga team. Fifa 15 I did a BPL team and this year not sure, may end up going with Liga BBVA (just down to Benzema), but am unsure of their defence and doubt I will ever afford Ronaldo or Messi. Reading your top 50 players in Fifa guide, I realise Benzema is one of the better strikers you can find. Anyway, thanks again for all the support. I look forward to playing draft mode very much. Hi Edward. I think I remember you. Nice to see you here again. About your previous comment I have no idea what happened but we do not delete messages unless they are offensive, which I’m sure it was not the case. The last published message from you was at February 9. You should keep with Benzema because his price will raise in a few days unless you think you can sell him for a good amount and you know what to do with those coins. We will publish the usual squads guides. Until there, try to make a lower level team. Many thanks for the reply, maybe the message didn’t get through, I have included it at the bottom of this post in case you fancied reading it. I think so far with the Ultimate Team Web App for Fifa 16, it seems smooth and pretty reliable, I lost connection a few times but I am throwing a lot of searches at it. As you said, coins are scarce so the market isn’t particularly great, I have found a few ways to make tiny profit, usually 100 coin each time at most (minus the ‘EA Tax’). I am enjoying it very much though so far. I think EA have been kind to new users as so far as you cannot put anything on the market for less than you could ‘quick sell’ it (as far as I can see?!). This makes it difficult to gain profit from players easily in previous versions when players are up for the minimum 150 coins. I know the market will be tough at the moment anyway as it is only experienced UT players who can even ‘get’ access to it. I’ve ended up trying to put together a good English Bronze Team to hopefully play the lower leagues with, as the chemistry will be good and I find 1 player seasons (especially the first few divisions) is easy coins and can be completed with bronze players. I don’t think the market is really interested in bronze players at the moment so this could be cheap little squad. I am interested though in what will happen when tons of players start playing, if they want to sell their cards quickly there will be a huge influx of cards onto the market and could be a great time to start investing some coin, on the launch/release day. (I wonder if this will happen with contracts too, as some players won’t realise they need them – I also assume a lot of players who buy ‘Deluxe Edition’ generally have an easy ride for contracts, I remember getting ‘Ultimate Edition’ last year for close to the normal price and contracts from these packs were invaluable). Great guide and information there, I love the opinions – I enjoyed many articles last season and Rodrigo may remember my comment about ZX Spectrum, playing against Samir Nasri in the game and Alan Shearer (I ended up getting Shearer [in the end] for Fifa15, hurrah!). The early ‘playing guide’ for Fifa 16 that has already been put together is great too. Anyway, I am not particularly great at Fifa and managed to get to ‘Online Seasons Division 2’ last season (with a fairly decent squad I put together after playing well over 1000 matches) – BPL squad. I used my fair share of pace players but did look at various strategies and teams, the game was obviously not particularly balanced ‘to say the least’. Anyway, I have a slight suspicion that EA felt attacking was ‘too easy’ last year and pace (we all know) was too effective, I think to counter this, EA have lowered some stats on players that were ‘too high’ or ‘overpowered’. This explains why they get the same rating, but are technically worse through ‘core stats’. It is an attempt to balance the game more. In theory, this should stop players doing successful ‘over the top’ through balls and just running past players all the time with pace. If passing stats have suffered, the passes shouldn’t be as successful every time and players shouldn’t be able to just run onto them as defending awareness should be better (depending on ‘positional skill/rating of course). Hopefully EA have actually come up with a good way to improve the game, I look forward to playing it very much. I don’t buy Fifa points, I ended up stopping buying packs halfway through last season with coins. I played a lot of the tournaments that gave free packs away when I could, I packed a few decent players by the end…. Neymar, Suarez, Di Maria, Rooney and Neuer (Shame I collected Bundesliga last year in Fifa14!!). Walcott / Sanchez (UP) – 81/85 – Walcott always seemed way too good, especially considering his injury record. Costa (TOTS) – 93 (went from Costa UP, to Costa SIF, to Costa TOTS, I felt Costa SIF was my most successful out of them to be honest, not sure why – whether competition improved, I played over 20 games with TOTS). Backup/Fitness squad (mainly out of ‘packed players’ from playing tournaments offline). LLoris (IF) – 86 (as GK never need rotating and I Bundesliga didn’t fit the players I packed except Neuer). I tried Alexis Sanchez in the 2nd team but Cabella had far better chemistry. I found that the ‘fitness squad’ struggled to cope with fast attackers due to their speed, and the defending wasn’t great from them either. I cannot decide who to collect this year, but will probably base it on the usual ‘if I get a great player in a pack’ (which has never happened early on). The ‘high attacking work rates’ on some defenders and the fact Kompany has taken a dip (as expected) in rating and stats means I may shy away from BPL and hopefully will do some form of ‘1st team hybrid’ – I like the look of Chellini (obviously? Lol) this year, and wonder if he’ll be a realistic aim to get before Christmas. Still, have no clue how I would base a defence or Hybrid side around him. I ended up selling my Costa TOTS and MOTM Toure and buying Shearer, along with SIF Wilshere and TOTS Henderson, with Walcott on the right. Up front with Shearer I play Strurridge or Rooney usually. Haven’t played much with Shearer considering, but want to try out Kane and maybe Rooney in midfield. Shearer isn’t quite as effective as I’d hoped, but he’s still pretty good for what he is, I’d like to end up with Lineker up front with him to make the MOTD commentary partnership in legends lol (someone else mentioned this on a separate forum somewhere) – Maybe Owen instead, but as Fifa 15 time has almost run out, I probably won’t manage this now. One question, does the ‘WebApp’ for Fifa16 open on 14th September, or is it later, I have seen different dates in different places. The first impressions I have from FIFA 16 are like yours. I get this when logging in. I have tried with both PS3 and PS4. And i have both console. Hi Marcus. There are hundreds of people complaining about this problem. According to EA Sports, the FUT 16 Web App is not working at full capacity yet. Only tomorrow. It can be that too. I have another problem. It says I don’t have a FUT club. The thing is I played Fifa 15 Ultimate Team but I have the same screen as the 2nd screenshot on this page. You played before August 1st ? According to EA Sports, the FUT 16 Web App is not working at full capacity yet. Only tomorrow. It can be that too. Try in a different time. Try in a different browser. Try in a different computer. Try with a different ISP. Use the latest version of Adobe Flash Player, Firefox, Chrome, or Safari. My Web App says: Continue playing FUT on PS4 to unlock access to the transfer market.. But I don’t understand why, because i’m playing Ultimate Team on PS4 since FIFA 14? Is there a chance to unlock the market? Usually that happens when you were playing on PS3 and then you choose PS4 as your default console. Sorry, but you will have to contact EA Support about that. I made an account today and can’t access the web app. I’m guessing that the account was made too late as being the reason why. Also, I’m still happy to help edit your articles. No doubt you feel the English is improving but I can really help you take the quality of English to the next level. Feel free to send me a email, please. i only connected the webb app today. have i lost the daily gift of yesterday (15th)? If you only got one daily pack today, then yes. You lost the yesterday’s daily gift. rodrigo can you clarify a few things for me. 1. you were suggesting that we sell the players we dont need and accumulate coins – all the players i have packed are completely useless and dont plan to use them in the future. Should i try to sell them all? then i will left with untradeable players. Wont it be difficult to play matches with these players. 2. also i did not understand about your concept of buying managers? what managers are you talking about? and where is it shown that they will increase the contract percentages? 3. also i will be getting the game on around 25th sept. When should i plan to buy the contracts and players i wish to play with? 1) You will not play until next week, unless you have early access. If you sold them now, you have time to make more coins and build a better team before you play. 3) If possible before 22nd, because then they are supposed to be more expensive. I didn’t have played fifa 16 yet but i have done fifa 15 on my xbox 360, am i a new fut player? No. You are a returning player. However, if you plan FIFA 15 on your XBox One, then you are a ‘new player’ and you will not be able to Web App early access. I get the welcome back screen, choose my xbox one version enter my security code and then all i get is the back drop of the stadium nothing else loads up. It’s because probably servers are overloaded. Web App will be at full capacity only tomorrow. Try again later please. Probably the servers were overloaded. Try again later or in a another browser/computer. 5k from daily pack ?! Not bad at all…! Many people is getting that error. Until now we don’t know how to fix it. It is probably because the Web App won’t be at full capacity till the 17th. The best I can do now is to wish you good luck. Mine says ‘Continue playing FUT on PS4 to unlock access to the transfer market’, I have been playing on PS3 and am getting a PS4 this week. Is there any chance I could use the transfer market on the Web app for PS4? No. We will update this post with that important question. If you have not played the previous FIFA in the new console, you will need to validate FIFA 16 first. Only then you will have access to the market. EA Sports have announced that they need to check the new accounts to see if they are bos or not.. In other words, after you play FIFA 16 in your new console, you will have to wait a few more days until they release Apps for you. Hi. We are not EA. We are just trying to help the community. In this case, we are explaining you how it works. Apologies accepted. To EA Sports, if you stop playing by a single year, you are not a return player for them, no matters how many FIFA you have played in the past.